20I5, to date, has been marked by two significant events: Roch Carrier’s Montcalm & Wolfe was a finalist for the 2015 Governor General’s Award for translation, and… my translation of Samuel Archibald’s short story collection, Arvida, was a finalist for the Giller Prize. 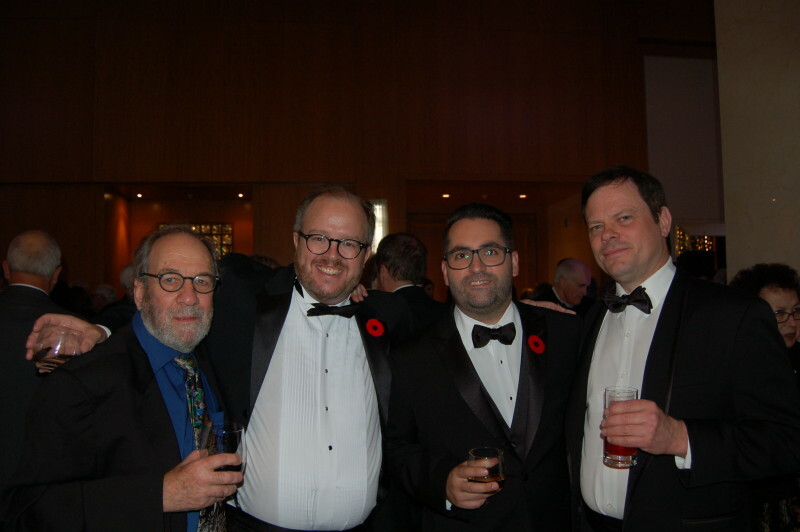 Below is a photo of the Arvida team at the Giller gala: myself, Biblioasis publisher Dan Wells, Samuel Archibald, and editor Stephen Henigan. The year 2014 was marked by two translations: Jean-Claude Germain’s second volume of Montreal memoirs, Of Jesuits and Bohemians (Le Coeur rouge de la bohème), and Roch Carrier’s monumental dual biography of the two doomed generals on the Plains of Abraham, Montcalm & Wolfe (Montcalm et Wolfe). 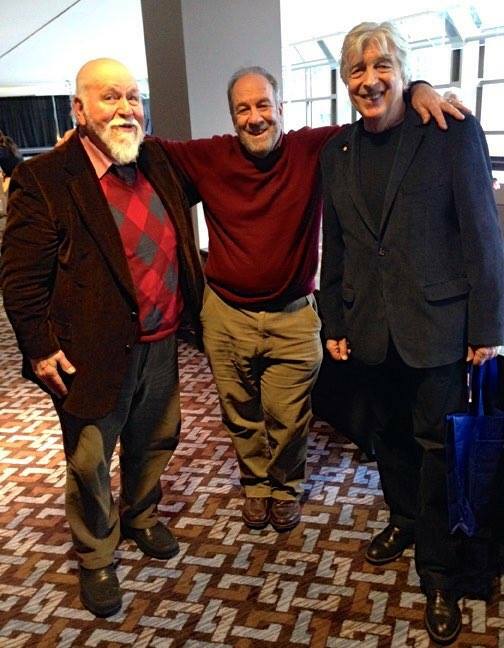 Here I am posing with them after their appearances at Montreal’s Books and Breakfast, in November. Winnipeg-born translator and filmmaker Donald Winkler came to French through his mother, who moved from Romania to Canada around 1920, when she was fifteen, following the early death of her own mother. “She studied French there, and had this wonderful, idealistic attachment to the language,” he explains over the phone. “It was connected to her nostalgia for her youth.” Winkler subsequently took courses in university and, in the mid-1960s, spent a year and a half in Paris “teaching English and going to movies.” Last week, in a ceremony at Rideau Hall, David Johnston presented Winkler with his third Governor General’s Literary Award for translation—for Pierre Nepveu’s poetry collection The Major Verbs (Les verbes majeurs). In Winkler’s remarks of acceptance, he said, “My responsibility is to treat every text as an offering, to be transformed, but hallowed, as it is shepherded from one tongue to another.” He is married to Sheila Fischman, an award-winning translator in her own right—in his words, the “doyenne of Canadian literary translation.” The couple live together in Montreal. Julien Russell Brunet: Do you think about adopting another writer’s voice when you translate? Or do you approach it more literally? Donald Winkler: You can talk about feeling your way into the identity of the writer you’re translating. But, for me, it happens more on the level of the language. I don’t want to diminish it in any way, and I’m not, but existentially translating is a very, very fascinating and sophisticated word game. Julien Russell Brunet: How does poetry compare with the other forms you’ve taken on? Donald Winkler: Poetry is the pure, intense experience. When you’re trying to choose the words you want to use, you have to be guided by the context in which the words are written. Sometimes, it’s the meaning that takes priority. Sometimes, it’s the music. Sometimes, it’s the rhythm. You have to gauge these things as you’re going along. It’s kind of like a Rubik’s Cube. Julien Russell Brunet: You’ve translated Nepveu on several different occasions now. Why are you drawn to his writing? Donald Winkler: I cut my teeth in translation on the poetry of Roland Giguère—an important Quebec poet who was influenced by the surrealists and lived through the Duplessis regime. His poetry is tight and surreal and full of verve and wordplay, and that was a real revelation to me. In some sense, I guess I was looking for something that would offer the same kind of challenge, and I found that in Nepveu’s writing. I immediately felt a closeness to his poetry. I’m very happy I was able to win this award for him. Julien Russell Brunet: I’m not sure many Anglophones are familiar with Nepveu’s work. How would you describe his poetry? Donald Winkler: It’s visceral. His images are very concrete—not naturalistic, but concrete. And there’s a kind of souffle and muscularity in his poetry, a kind of impetus where at times it’s like you’re tumbling down hill with the language. He’s a gentle, self-deprecating guy in person, but when he gets in the groove in his poetry, he’ll take off on these surreal riffs. He’ll just let himself go and you have to keep up with him. Julien Russell Brunet: If you weren’t a translator and filmmaker, what would you be? Donald Winkler: Growing up, I wanted to be a shortstop, but I didn’t have the gift. I’d still like to be a shortstop. Julien Russell Brunet: You’ve worked on a variety of different projects now. Poetry and novels. Books on aviation, Glenn Gould, the cosmos, Riopelle, etc. Not to mention your film work. Any favourites? Donald Winkler: Seyhmus Dagtekin’s stylized memoir, To the Spring, by Night, was a real labour of love. This is a guy who lives in Paris, but grew up in a tiny Kurdish village in the Turkish mountains. It was isolated, had no electricity, virtually no literacy, and was almost animist in nature: every rock, every spring had a spirit associated with it. He wrote this book that evoked that childhood and it’s absolutely beautiful. The French is simple and stripped-down and I knew it would be hard to reproduce, but I fell in love with it. Mauricio Segura’s Eucalyptus (Biblioasis Publishers, my translation) has been declared one of the 100 best books of 2013 in an Editors’ Pick at Amazon.ca. 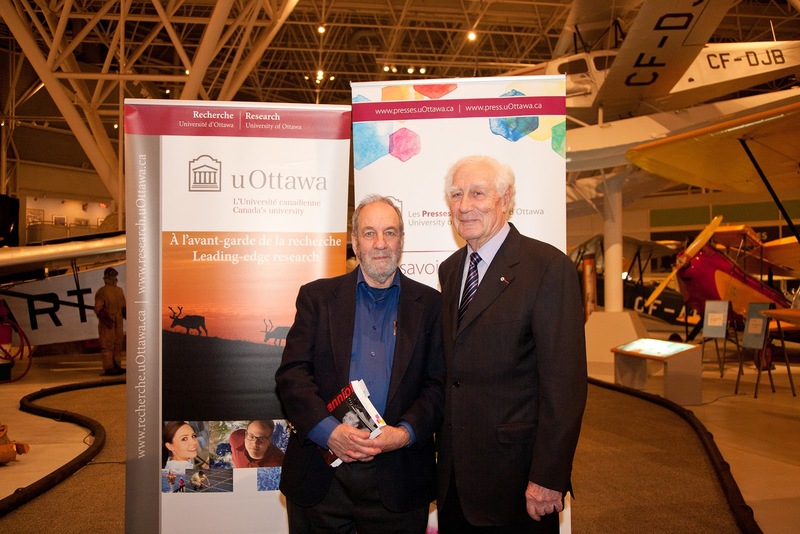 Tonight, amid an impressive array of vintage aircraft at the Aviation and Space Museum in Ottawa, there was launched Taking Aviation to New Heights: A Biography of Pierre Jeanniot, published by the University of Ottawa Press, in my translation. Present were M. Jeanniot, Jacqueline Cardinal, co-author of the book (with Laurent Lapierre), director of the Press Lara Mainville, and many old friends and colleagues of M. Jeanniot. The book is an impressive tribute to a man who made significant contributions to Canadian and international aviation, and who has led a remarkable life. There will be a Montreal launch for the book on November 28 at Le Cercle restaurant at the École des Hautes Ètudes Commerciales.